On the Boulevard de la Croisette just 1800 ft from the Palais des Festivals, this sea-front hotel offers a private beach, a Michelin-starred restaurant and accommodations with sea or city views. Bulgari toiletries, flat-screen TV with satellite channels and free Wi-Fi access are found in each spacious and air-conditioned room and suite at the Grand Hotel. Some rooms also have a private balcony. The Michelin-starred restaurant, Le Park 45, offers gourmet cuisine made with fresh local products. Meals can be enjoyed on the spacious terrace, overlooking the grounds and the sea. Guests of the Grand Hotel can also enjoy a cocktail or a light meal at the hotel bar, Le Cercle. Rue d'Antibes is just 165 ft from the Grand Hotel and the SNCF train station is just a 10 minute walk away. The property is 16 miles from Nice Côte d'Azur Airport. Les Félibriges is in the Suquet quarter of Cannes, half a mile from the Palais Des Festivals and 100 yards from Midi Beach. It offers apartment accommodation and a pool. Each of the air-conditioned studios and apartments has a kitchenette with a dishwasher, hotplate and microwave. Some of the rooms also have a furnished balcony. The residence is one mile from La Croisette and a 10 minute walk from the ferry port, providing access to the nearby Mediterranean islands of Iles de Lérins. Le Fouquet’s is located in the heart of Cannes, just 330 yards from the famous La Croisette beaches. It provides boutique-style accommodations with free Wi-Fi access. Each of the guest rooms is uniquely decorated, offering both contemporary and antique-style furnishings. They include air conditioning, a flat-screen TV with satellite channels and a balcony. Hotel Le Fouquet’s serves a daily continental breakfast which can be enjoyed in the lounge or in the comfort of your guest room. Le Fouquet’s is only a 10-minute walk from the Palais des Festivals and the ferry port, providing access to the nearby Iles de Lerins. Nice-Cote d’Azur Airport is 12 miles away. Hotel America provides 4-star, accommodation a 1-minute walk from the beach. It is near Rue d’Antibes, Cannes’ famous shopping street and has a business centre, 24-hour reception and multilingual staff. Hotel America rooms are soundproofed and air-conditioned with modern decor. Each room is equipped with a minibar, a flat-screen TV with international satellite channels, safe and a private marble bathroom. Free Wi-Fi is available in the entire property. There is a free computer in the lobby. America Hotel also has a 24-hour business centre that offers a variety of equipment and services including fax, printer, photocopier and secretarial assistance. Hotel America is conveniently located 300 metres from the Palais des Festivals et des Congrès where the Cannes Film Festival takes place each year. Shuttles to and from the Nice Côte d'Azur Airport are just 30 metres away and the train station is a 5-minute walk from the hotel. Palace Hotel is in central Cannes, only a quarter mile from the beach and La Croisette. It has a sunbathing terrace and an outdoor swimming pool. Every room at the Cannes Palace Hotel guest is air-conditioned and has a private bathroom, an LCD satellite TV, Wi-Fi access, and some rooms also have a balcony. Guests can relax with a drink in the hotel’s Cocoon Bar, which features wines, beers and soft drinks. Breakfast can be delivered to your room for an extra fee. Guests can also use the fitness room and the computers in the hotel’s business center, which has a free internet connection. The Palais des Festivals and the ferry to Île Sainte-Marguerite are one mile from the Cannes Palace. Cannes Train Station is a 5-minute drive from the property. In Cannes, the Cézanne is 600 yards from the beach and Boulevard de la Croisette. It provides soundproof accommodation and a spa area with a hammam, massage and beauty treatments. Free Wi-Fi access and a flat-screen TV are provided in the air-conditioned rooms and suites at Cezanne Hotel Spa. Breakfast is served each morning on the grounds and terrace or in the guest rooms. The restaurant serves Mediterranean cuisine and is on the Cezanne’s private beach, CBeach. This 4-star boutique hotel provides 24-hour room service and Wi-Fi access is available at the Cezanne Hotel’s front desk. The Cezanne Hotel Spa is a 5 minute walk from Cannes Train Station and half a mile from the Palais des Festivals et des Congres. At the heart of Cannes, this hotel features a private beach and is 1700 ft from La Croisette. The swimming pool is in a garden with Olive and Cypress trees. A former 19th-century mansion, Golden Tulip Cannes offers rooms and suites decorated in baroque and contemporary design. They are equipped with air conditioning, Wi-Fi access and some have a terrace or balcony with views of the grounds or pool. The breakfast room is decorated in an elegant baroque style, with purple and silver velvets. A full breakfast buffet is served daily. In the summer there is a snack bar by the pool, and guests can relax on the terrace. The Golden Tulip Cannes Hotel de Paris is just a 3-minute walk from the famous shopping street, Rue d’Antibes. Hôtel La Villa Cannes Croisette is located just 50 yards from the Boulevard de la Croisette beaches in Cannes. It provides a heated outdoor pool with a terrace and a Mediterranean garden. Each air-conditioned room is stylishly decorated in tones of black and gold. Some rooms have a private terrace that overlook the pool. An LCD TV, free Wi-Fi and a minibar are provided in each room. La Villa Cannes also features a relaxing lounge bar where guests can sample champagne from the hotel’s vineyards. A buffet breakfast is served daily by the pool. Room service is available 24 hours. A 24-hour front desk is available at the Hôtel La Villa Cannes Croisette. Beauty services including massages and manicures can be arranged through the hotel. Palm Beach Casino is 550 yards from the hotel, and the Palais des Festivals is a 20 minute walk along the beach. Bicycles can also be rented from the hotel. Cannes Train Station is a 5 minute drive away. Renoir provides 4-star accommodations, a 5-minute walk from the Palais des Festival, the marina and Rue d'Antibes. Guest rooms and suites at the Renoir are soundproof and air-conditioned. Each room comes equipped with a minibar, flat-screen TV with satellite channels and has a full private bathroom. Some also have views of the Mediterranean Sea. Guests are invited to relax with a drink in Renoir’s bar and order a meal through the hotel’s 24-hour room service. Hotel Renoir has secretarial and car rental services. Wi-Fi and private parking are also available for an additional fee. Renoir is conveniently located 320 yards from the Cannes Train Station and 16 miles from Nice Airport. Only 3 miles from central Cannes, the Chateau de la Tour is just a 10-minute walk from the Midi Beach. It features an outdoor swimming pool, gardens with a terrace and massages with prior reservation. Each room at the Chateau de la Tour Hotel is soundproof and equipped with air conditioning and a TV. Some rooms also have a view of the Mediterranean Sea. A continental breakfast is served each morning and evening meals are available from 7 pm until 9:30 pm. Additional facilities include free Wi-Fi access. Hotel Chateau is 2 miles from Boulevard de la Croisette and Nice Cote d’Azur Airport is a 25-minute drive away. Private parking is available on site. The Best Western offers a rooftop swimming pool and terrace with panoramic views of Cannes. It is just a 5-minute walk from the Boulevard de la Croisette and the beaches. The rooms and suites at the Best Western Cannes Riviera are air conditioned and soundproofed. Each offers a flat-screen TV with satellite channels and Wi-Fi access. The Cannes Riviera has a lounge bar and a basement wine bar. Guests can enjoy a daily buffet breakfast in the hotel’s large courtyard. The Cannes SNCF train station is just 550 yards from the Best Western Cannes Riviera and Rue d’Antibes is a 5-minute walk away. A secure private parking lot is available. Hotel Regina is located in central Cannes, facing La Croisette and 55 yards from the beach. Set in a former mansion, it has a private grounds and offers sea views. The air-conditioned guest rooms are decorated in a Provençal style, with oak furniture and spacious bathrooms. They are equipped with Wi-Fi access and some have a private balcony or terrace. Hotel Regina serves a daily continental breakfast that can be taken in the guest room, or in the hotel lounge. The Regina is only half a mile from the Palais des Festivals and a 15-minute walk from the port, providing access to the Iles des Lerins. The Orangers is a 5-minute walk from the Boulevard de la Croisette in Cannes. It offers a view of the Esterel Mountains and an outdoor swimming pool, which is covered and heated during winter. Rooms at the Hotel des Orangers have a private bathroom and are equipped with free Wi-Fi, satellite TV and a radio. A breakfast buffet is served daily in the dining area or on the terrace during summer months. Guests can enjoy traditional cuisine at the Orangers’s restaurant, Bacchus. The Orangers is located in the historic quarter of Cannes (le Suquet) less than a mile from Cannes Train Station and the Palais des Festivals. The Cannes-Mandelieu Airport is a 10-minute drive away. Eden Hotel & Spa, in the heart of Cannes, on rue d'Antibes, the main shopping street and only 500 ft from the famous La Croisette beaches. It features free access to the spa including an indoor, heated pool, Turkish bath, hot tub and fitness area. This modern hotel features bright guest rooms with a unique design, air conditioning, satellite TV and free Wi-Fi access. The Afro-modern restaurant, Akwaba, serves a range of contemporary and healthy dishes. A daily buffet breakfast is served in the dining room. The fireside bar is open every night and has a range of cocktails. Guests at the Eden Hotel & Spa also have access to an outdoor swimming pool, hot tub and the panoramic rooftop terrace at the hotel. The Cannes Festival venues and Congress Centre is just over half a mile from the hotel. 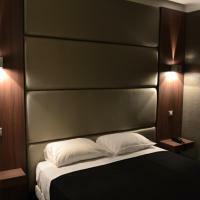 Amarante Cannes provides air-conditioned, 4-star accommodation near the center of Cannes. The hotel has a swimming pool, just half a mile from Boulevard de la Croisette. The Amarante rooms are soundproof. Each one comes with a desk, satellite TV and a private bathroom. The restaurant, La Farigoule, serves traditional Provencal cuisine for lunch Monday to Friday in the dining room or on the shaded terrace. You can choose from a buffet-style breakfast or an express breakfast. Amarante Cannes is located half a mile from the famous Palais des Festivals et des Congrès where the Cannes Film Festival takes place each year. In an Art Deco-style building, Best Western Mondial is on the famous shopping street of Rue d'Antibes, just 270 yards from Boulevard de la Croisette beaches. The soundproof guest rooms include air conditioning, free Wi-Fi and a flat-screen TV with satellite channels. Some rooms have a balcony with views of Rue d'Antibes or the Mediterranean Sea. The Mondial provides a daily buffet breakfast offering cooked and continental choices. It can be taken in the hotel lounge or in the guest room upon request. Best Western Mondial is a 5 minute walk from the Palais des Festivals, a quarter mile from Cannes Train Station and Nice-Cote d’Azur Airport is 12 miles away. With air-conditioning and soundproofing, the Best Western’s rooms all have a private bathroom, satellite TV and free Wi-Fi. The hotel is set in central Cannes, 220 yards from La Croisette. Cannes Beach and the Palais de Festivals are located just a short walk from the Best Western Hotel Univers. There are a number of bars and restaurants in the close vicinity. A buffet breakfast is available every morning in the conservatory dining room or on the terrace, which has panoramic views. Breakfast can also be enjoyed in the comfort of your room. Guests of the Best Western Hotel Univers can enjoy biking and horseback riding in the close vicinity and they can find facilities for golf and tennis nearby. Located in Cannes, the Résidence ExcelSuites is a 15-minute walk from the Palais des Festivals and La Croisette beach. It offers soundproofed suites and has a rooftop terrace with 3 Jacuzzis. The air-conditioned suites at the Residence have a separate sitting area and a flat-screen TV with satellite TV. Each suite has a kitchenette with a microwave and a dishwasher. The bus station next to the Residence ExcelSuites provides a 5-minute service to central Cannes and SNCF train station. The Residence is situated 6 miles from Cannes-Mandelieu Airport and provides private on-site parking. Located next to the Cannes-Mandelieu Airport, this Kyriad Hotel is just half a mile from the beach. It offers free private parking and soundproof accommodations with an outdoor swimming pool. Rooms at the Kyriad Hotel Cannes Mandelieu are air conditioned and equipped with private bathrooms, satellite TV and free Wi-Fi access. The restaurant, La Bastide Rouge, serves traditional and regional cuisine as well as a buffet of appetizers and desserts. It is open from Monday to Friday. A buffet breakfast is also available daily. The Kyriad Cannes Mandelieu is one mile from Highway A8/E80 highway and 3 miles from the Palais des Festivals and the Boulevard de la Croisette in central Cannes. Best Western Le Patio des Artistes is a 5-minute walk from the Boulevard de la Croisette and the beaches. It has an underground parking garage. The rooms at Best Western Le Patio des Artistes are all spacious and air-conditioned. Each features a flat-screen TV with satellite channels, an iPod docking station, an expresso coffee machine and a mini-bar. Breakfast is served every morning at the hotel. Guests can also enjoy a drink and use the free Wi-Fi access in the hotel's patio. It also includes a spa area with hot tub and a roof-top terrace with views of the Bay of Cannes. In a quiet location, Best Western Le Patio des Artistes is just a 10-minute walk from the Cannes Train Station and the Palais des Festivals et des Congrès, where the Cannes Film Festival takes place. Hôtel de Provence is in central Cannes and has a pretty garden and patio. It offers air-conditioned guest rooms with a bathroom, each with satellite TV and Wi-Fi access. With traditional French decor, the Provence is in a quiet area, a 5 minute walk from La Croisette, Cannes Beach and 10 minutes from the Palais des Festivals and Cannes Marina. The Hôtel de Provence bar serves regional wines and a variety of refreshing beverages. Guests can enjoy drinks and the hotel’s French breakfast on the grounds or on the terrace and patio. There are numerous restaurants and boutique shopping on the nearby side streets. Hotel de France is located on the famous shopping street, Rue d’Antibes, just 330 yards from Cannes' beaches and La Croisette. It has a panoramic roof terrace and free Wi-Fi. All of the soundproofed guest rooms include a private bathroom, air conditioning and flat-screen TV. They also have elevator access. Hotel de France in Cannes serves a daily buffet breakfast in the dining area. The hotel offers an Art Deco-style bar with books available to read. Hotel De France has a modern art exhibition on the first floor. Guests can relax and enjoy great views of Cannes from the rooftop terrace. This features a sun room and deckchairs. Hotel de France is only a 5-minute walk from Cannes Train Station and the Palais des Festivals is 711 yards away. Parking is subject to availability. The Cannes Beach Hotel is a 1-minute walk from the beach and the La Bocca shopping center. Pierre & Vacances Cannes Beach features a spa center with a sauna, hammam, hot tub and fitness room. Each studio, apartment and room has simple décor and a private bathroom. The apartments and studio are surrounding an interior courtyard and have a balcony. Each apartment also includes a full kitchen and a sitting area. Le Cabestan restaurant serves pizzas and traditional French cuisine, and children's menus are available. Guests can dine on a patio that is decorated with a sea theme and has exotic plants and enjoy a drink in the bar. There is a grocery shop at the entrance to the residence. Central Cannes is a 5-minute drive away, and Cannes - Mandelieu Airport is just over a quarter mile away, Gare du Bosquet Train Station is less than half a mile from the hotel. This Résidence features a large outdoor swimming pool and tennis court, set 165 ft from the beach. It has self-catering apartments, a hot tub and sauna, located 1.2 miles from central Cannes. Each of the Pierre & Vacances Cannes apartments has an equipped kitchen, a living room with a TV, and a balcony with patio furniture. Some offer spectacular views of the Mediterranean. Guests of the Résidence can play ping-pong in the game room or relax on the sunbathing terrace or in the flowered garden. Wi-Fi internet is available at the front desk. Snorkeling and other water sports are available at the nearby beaches. Résidence Pierre & Vacances Cannes Verrerie is a 5-minute drive from Cannes harbor and La Croisette. This residence is on a tree-lined property in the quiet residential area of Croix des Gardes. It offers an outdoor swimming pool with wading pool, a restaurant and a mini-market. Apartments come with a TV and a kitchenette. All rooms have a sitting area and a private bathroom. Wi-Fi access is available. Guests of the Cannes Villa Francia can use the tennis court, ping-pong and a game room with numerous activities offered. There is also a children's playground. The residence also has a bar and restaurant opening out onto the terrace, which offers panoramic views of the sea. The Pierre & Vacances Cannes Villa Francia is 1.5 miles from Cannes. Guests can enjoy water sports at the nearby beaches and visit the nearby Cannes and Antibes. Hotel Ligure is in central Cannes, just 325 ft from the famous shopping street, Rue d’Antibes and a 5-minute walk from La Croisette beaches and the Palais des Festivals. The soundproof guest rooms include air conditioning, cable, LCD TV and Wi-Fi internet access. Serviced by an elevator, they also provide a minibar, a hairdryer and a safe. Hotel Ligure serves a daily continental breakfast which can also be taken in the guest room upon request. In addition to a 24-hour front desk, the Ligure Hotel also provides a laundry service and public parking is available nearby. Cannes Train Station is just a 1-minute walk from the hotel and a public parking lot is available 500 ft from the hotel. Hotel Le Festival is located in central Cannes, 300 ft from the Boulevard de la Croisette and the beaches. Guests have free access to the sauna and jacuzzi. The soundproofed guest rooms have free Wi-Fi access and are equipped with a flat-screen TV with satellite channels. Each room is air conditioned and has a private Italian-marble bathroom. The luxury boutiques of Rue d’Antibes are just 65 ft from Le Festival. The Cannes SNCF Train Station and the Palais des Festivals et des Congrès are less than a 10-minute walk from the hotel. This hotel is in a quiet part of Cannes, a 15-minute walk from the Boulevard de la Croisette. It offers rooms with free Wi-Fi and views of the flower-filled garden. Each guest room at Idéal Séjour is individually decorated and has satellite TV and a private bathroom. The daily buffet breakfast, which is made with homemade products, is served in the garden. The Idéal Séjour has a lounge and a large library with more than 1000 books, and a free private parking lot. Guests have access to the workstation in the reception area, which includes a computer, printer and internet access. The Séjour is less than one mile from the Palais des Festivals and the SNCF train station. The Majestic Barrière is on La Croisette in Cannes, 120 yards from Palais des Festivals and the old port. It features a private beach, a spa, a casino and an outdoor pool with a furnished terrace. The Barrière Cannes has air-conditioned, soundproof rooms with a satellite LCD TV, Wi-Fi access and a grand private bathroom. Some rooms also have a balcony with sea views. Guests at the Majestic Barrière can enjoy massage and relaxation therapies in the hotel spa and relax on the hotel’s beachside sunbathing terrace. The hotel also has a beach restaurant and an on-site restaurant, La Petite Maison de Nicole, which serves traditional cuisine. Guests can enjoy a drink in the Barrière’s bar and visit the well-known casino. The hotel is just a one-minute walk from the beach and a quarter mile from Cannes SNCF Train Station. Secure private parking is also available for an additional fee. This 4-star hotel is located in central Cannes, just 165 yards from the beaches of La Croisette. It offers a private beach, an outdoor swimming pool and a sauna. Each air-conditioned guest room at the Grand Hotel Mercure Croisette Beach has a flat-screen TV with satellite channels and Wi-Fi access. Most rooms also have balconies with a partial sea view or a view of the grounds. Le Bellini, the hotel's 24-hour bar and restaurant, serves traditional cuisine and a daily breakfast. Meals can also be served on the pool-side terrace, overlooking the grounds. Additional facilities at the Grand Hotel include private valet parking and a 24-hour reception. The hotel is a 20-minute walk from Cannes SNCF train station and 30 minutes from Nice Côte d’Azur International Airport. In the historic district of Le Suquet, l’Olivier is 320 yards from Cannes’ beaches and the Palais des Festivals. It features air-conditioned guest rooms with Satellite TV and free Wi-Fi. Hotel de l'Olivier rooms are decorated in a traditional Provençal style, and include air conditioning and Satellite TV. Most of l’Olivier’s rooms face the sea, the flowering garden or Notre Dame d’Esperance church. Hôtel de l’Olivier has a garden and conservatory overlooking the outdoor swimming pool. A buffet breakfast is served daily on the covered terrace. There is a lounge bar where guests are invited to relax. The hotel also offers private parking with a valet service. The islands of Sainte Marguerite are 15 minutes away by boat. This Residence Resideal is located next to La Croisette, in central Cannes. It offers air-conditioned accommodation with an outdoor swimming pool, hot tub and sauna. Each studio at the Residence Residéal Cannes is equipped with a flat-screen TV, satellite channels and en-suite facilities. They also have a fully-equipped kitchen with a dining area. Guests can relax in the Cannes Resideal’s bar and there is also a garden terrace. The Residence provides a 24-hour reception, luggage storage, a laundry service and private parking onsite. Wi-Fi access is also available. Just 650 ft from the SNCF train station in Cannes, the Appia is a 5-minute walk from La Croisette and its beaches. It offers air conditioned accommodations with free Wi-Fi access. Rooms at the Appia Hotel are serviced by an elevator and equipped with a private bathroom. Each room has a flat-screen TV with satellite channels. A continental breakfast is served daily, and staff at the Appia can provide tourist information at the 24-hour front desk. Hotel Appia is situated behind the Rue d’Antibes and 1000 ft from the Palais des Festivals. It is an ideal base for exploring the French Riviera and the harbor is a 15-minute walk away. This hotel faces the sea and is 55 yards from the South Beach in Cannes. It offers free access to the outdoor swimming pool and tennis court, and guest rooms have a panoramic mountain view. Each room at Avangani Resort is air-conditioned and provides a flat-screen TV and satellite channels. Some rooms also have a private terrace or balcony. Guests can enjoy innovative, Mediterranean cuisine at the Avangani’s restaurant, Epices et Caramel. It has an outdoor terrace that overlooks the shaded garden and the Mediterranean Sea. Sun lounge chairs around the pool are available for an extra charge, and the price includes one soft drink. The Palais des Festivals and the Boulevard de la Croisette are just a 5 minute bus ride from the hotel. Cannes Mandelieu Airport is 2 miles away.